With shooters like Viriax bonuses often make or break the game, and quite a few of the pickups available to your actually-kind-of-cute virus change the gameplay in ways that reach further than giving you shiny new ammo. 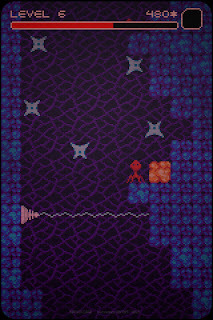 Straight out of the box Viriax plays like the obligatory underwater level of a platformer, with the tentacled little virus pluckily swimming upwards, fighting against gravity. 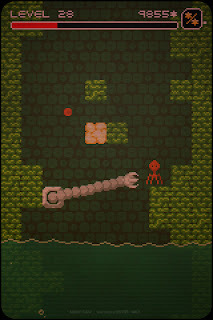 The high jump and big jump bonuses negate the worst of gravity’s effects and make for more traditional platformer gameplay, while the float bonus makes the virus buoyant, suddenly making Viriax play like a vertical scrolling shooter. 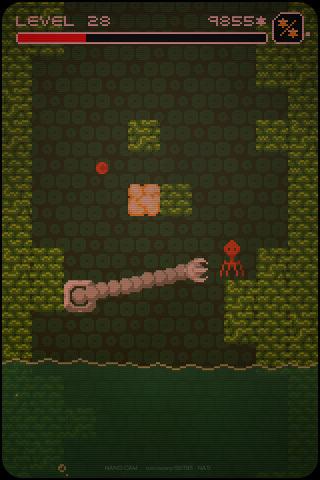 A health bar that depletes with every jump, as well as every collision with the antibodies protecting the organs, brings a greater sense of intensity to the game as moves become gambles to balance energy expended with the chance to absorb revitalising red blood cells. This compelling and changeable gameplay is accompanied by an atmospheric, pulsing soundtrack courtesy of video game musician Gryzor87, with eerie synths floating over incessant, tense rhythms. 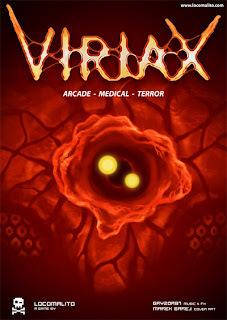 Viriax's graphics are rich and characterful, with an almost-adorable virus protagonist and suitably biological looking defenders to battle past. The "nanocam" legend at the bottom of the screen is a nice flourish; the idea that the player is watching the progress of the virus through an iPhone shaped screen makes me smile. Clearly if you’re a virus bent on destroying a human body There's An App For That. All told Viriax is a ferociously addictive game. Randomly generated maps and a host of organs to trash means that this game designed to be simple and short-lived in fact has enormous replay value, and the idea of playing the littlest bad guy imaginable is simply brilliance. 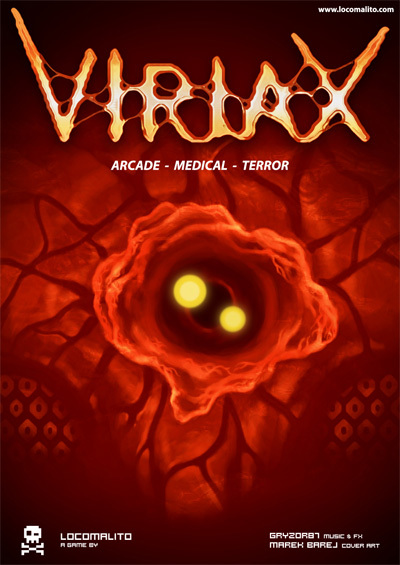 Download Viriax here (from the Locomalito website). Does this game hurted anyone? Some games (Cave Story, Momodora) we're primarly aimed at hurting? I would suggest that (from the subject matter) Viriax is NOT a game for young children. And why do you think Pixel has been punished?! ?